I had forgotten how enjoyable a well-written saga can be, that feeling of enormous satisfaction of following a family through their ups and downs, or more usually, downs and further downs, spanning decades isn’t replicated in the same way in any other type of genre and in One Last Dance I felt I’d travelled on a journey with Esme starting at the time of World War I and continuing to the 1970’s. In 1974 Esme decides she wants her 75 birthday party to be held at Rosindell a somewhat diminished grand house which belongs to the Reddaway family and while we witness a scene where her daughter is somewhat perturbed at this choice of venue the story then switches back to 1917 when Devlin Reddaway visits England while on leave. The story that follows has all the normal components of love, jealousy, secrets and lies that you’d expect from the genre and pleasingly well-executed. The pace is measured and despite there being, as you’d imagine over such a time-span, quite an array of characters, these are well-defined so that there is no confusion. Judith Lennox has created some great characters, which develop well over the course of the book without ever losing their central characteristics thereby allowing the reader to sympathise or react in horror at the actions they choose to take. The key protagonists are Esme and her elder, more beautiful sister, Camilla and Devlin Reddaway with the relationship between them being central to the story although as the book progresses we get to know the younger generations and understand their lives in context of the past. Much of the setting is the wonderfully described Rosindell, which Devlin’s father had failed to maintain and the house he is determined to restore to its former glory, but there are other settings that Judith Lennox brings to life as far apart as London during World War II and San Francisco in the 1960’s where another house is built by one of Devlin’s children. The earlier part of the book concentrates on a close time-span depicting the events that will haunt the family for decades to come while later on the sections depict wider ranging dates which avoids slowing down the pace and better still these sections add further nuance and complexity to the story avoiding the feeling that they are included for filling purposes. In fact every one of the 500 plus pages adds a little to the story either in way of place, character or plot. This is a gentle nostalgic story with enough action to keep the reader engaged with fantastic descriptions of both time and place that add to the richness of this read. I’d like to thank Bookbridgr along with the publishers Headline Review for allowing me to read a copy of this book which was published in paperback on 11 September 2014. Cleo – Sometimes those family sagas are really absorbing aren’t they? You feel you get to know the family, and you feel you care about its members. When the story is well enough written, you also feel drawn in by the senses of place and time over the years. Glad this one did that for you. It was just what I needed for a satisfying break from crime fiction – I was totally immersed in the family tale which only works when this genre is really well-written. I enjoy reading sagas and this one looks to be a good one. I will need to keep my eyes open for this one. I don’t read them very often anymore but this one was the best I’ve read in a long time – I hope you enjoy it if you find a copy. I like family saga’s. I think that well written books that span over several tales with the same family makes it easier to stay interested in them. Cleo, it sounds like my kind of book. Thanks for the review. 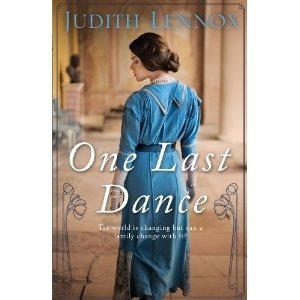 I used to love Judith Lennox’s books, but I haven’t read one for ages. Sounds like it’s time to catch up! As you can probably tell, I really enjoyed Esme’s story, it was a book to loose myself in so I’ll be looking out for copies of those that I’ve missed over the years. What a great review! There’s always a place on your shelf for sagas like this. They just fill a need sometimes. Exactly, this one is really well-written and covers a lot of ground and had characters who felt real.